The former, narrower 5 cwt BB series was similar. 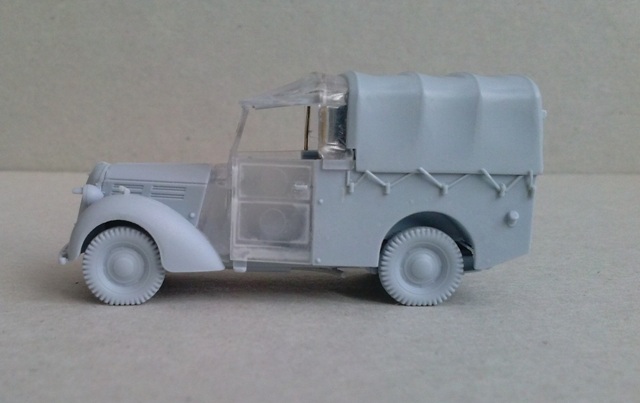 It can be quickly recognized by the different forward mudguards layout and the step at the base of the side doors. The later UV series (allocated also to the Army and the Royal Navy) was quite different, having a longer wheelbase chassis, vertical windshield, different radiator mesh, wheels, sides and doors. 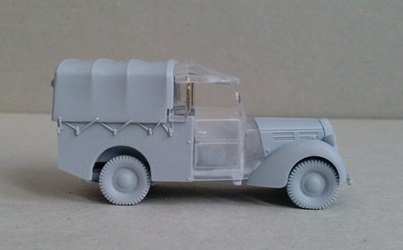 For the Army Tillies the WD vehicle class prefix was the letter M (but this is not the case of this kit model which wasn’t allocated to the Army). For a UV Tilly walkaround see here: http://www.wheelsofvictory.com/Brit%20index2.html . About the DC series production changes, the only evidence I found is about the lights which became smaller and set farther apart. Sadly I found only a handful of photos and very little information. What surprised me was that the DC 10 cwt had independent front suspension with a transversal leaf spring and not the double longitudinal leaf springs of the kit (see here: http://www.standardmotorclub.org.uk/page780.html). Judging on the basis of the drawings in the article, the Airfix DC 12 hp (10 cwt) kit seemed to have, under a DC body, an UV 14 hp chassis with the DC wheelbase. I looked for photos of the real structure with no results. I didn’t find a walkaround on the net and only two DC are still preserved today. At the end I wrote to the Tilly Register site. 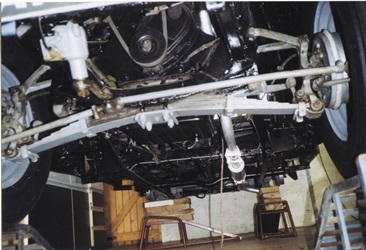 Luckily Michael Shackleton kindly sent me three photos which show the front suspension system. It was effectively completely different! The differences can be described, concisely, as follows: the front axle was a rod, shaped as a large opened “omega” attached to the chassis and which embraced the engine belly. At the endings of the axle, there were two vertical “V” shaped structures. At the lower single point of this was a hinged rod, at the upper points were the hinges of the double endings of the wishbone piece. 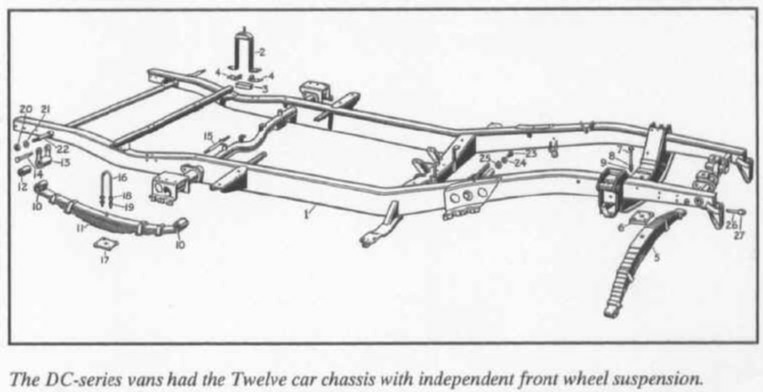 The opposite rod end and the single end of the wishbone were hinged to the wheel hub. The wishbone and the single rod could move up and down for the suspension of the wheel, with the hub attached to them. 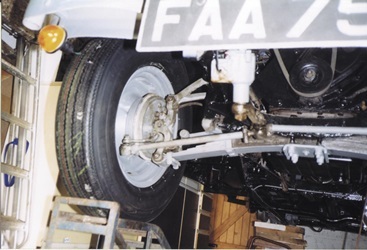 Attached to the centre axle bottom there was the transversal leaf spring which endings are attached to the wheels hubs. After having taken the dimension to maintain the same ground clearance, I removed the axle with the two leaf springs from the front suspension. 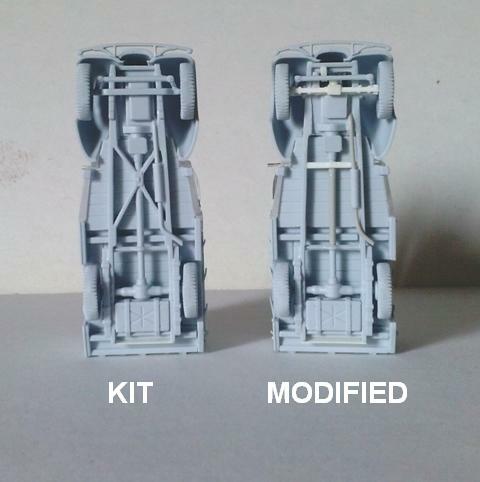 I shortened the engine belly to the axle level and the forward lower profile of the chassis was filed to the shape shown by the drawing visible here: http://www.standardmotorclub.org.uk/page780.html. I removed the “X” structure, the exhaust and the transmission rod. as well as the exhaust with the thinnest rods available. A plastic strip was added just after the gear box. 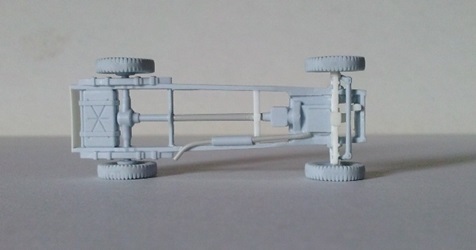 The front suspension structure described above would be a bit fragile if reproduced correctly. Being partially hidden by the wheels and the mudguards, I took some licence to have a strong attachment. Following the photos, a new solid axle was made with plastic. 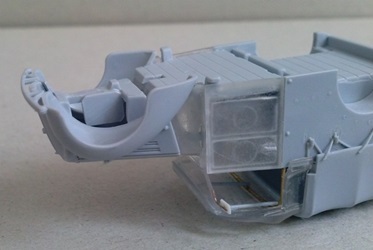 From the front, the engine was simulated with a thin little plastic piece. To this I glued a rounded piece of plastic for the lower distribution pulley. 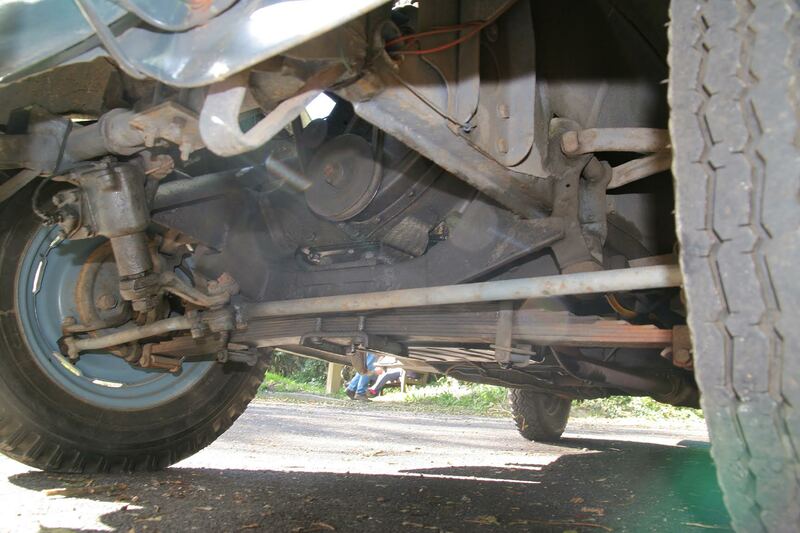 After having glued the wheels, kept together by the steering rod, a leaf spring from the spare box was attached to the lower side of the axle. Stretched sprue provided the material for the smaller details. 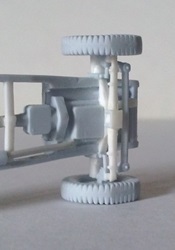 The steering gear and arm were added to the frame with stretched sprue and plastic strip. 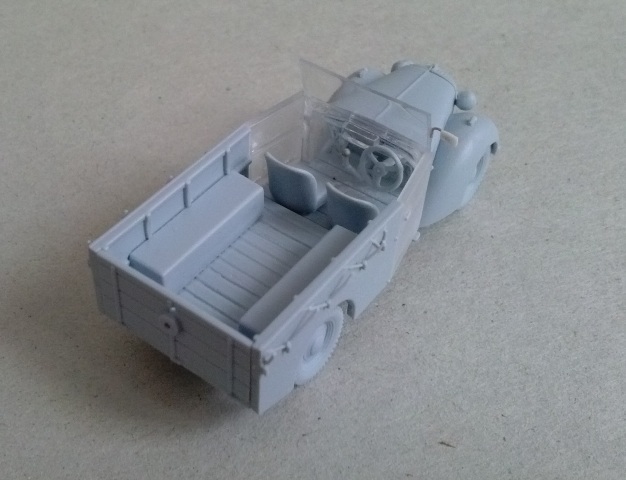 Looking at the photos, the belly of the vehicle looks filled with other little details. Both the little scale and the poor visibility of the details led me to be satisfied with the described job. 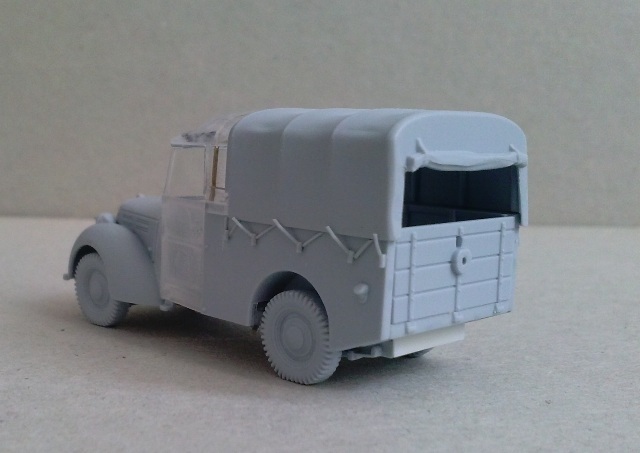 I didn’t add anything else and think it now looks more likely the true chassis. The body floor is smooth. 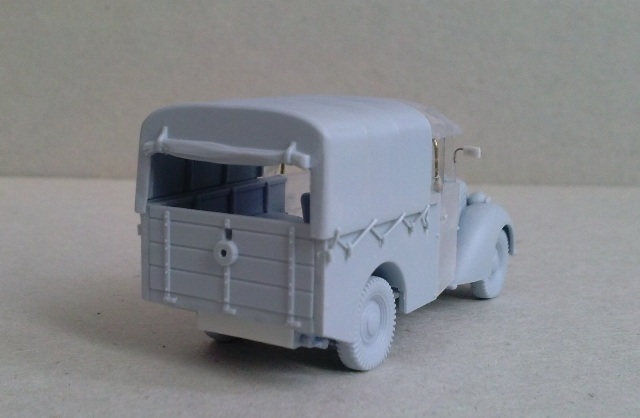 Based on the photos of the restored vehicle it seems to be made with wood planks. To engrave their lines I carefully cut off the wheelhouses and then I engraved the lines. The wheelhouses were glued in place at the end. The riveting relief on the sides is oversized and in the photos it is not visible. I cut it off without sanding it down, to maintain the hint of it. 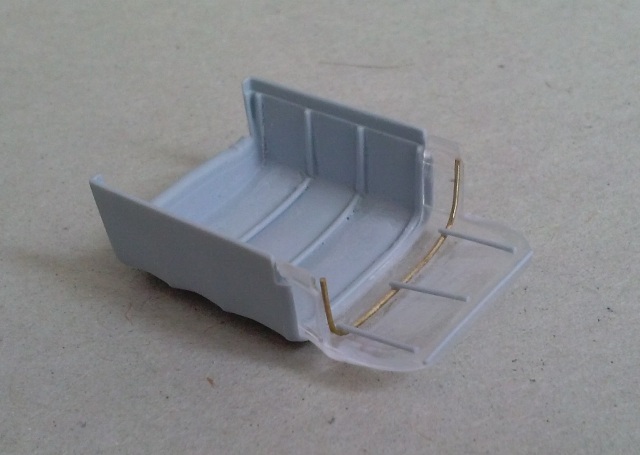 Also the items just forward the cover wire hooks are absent in the photos I used; they were totally erased. 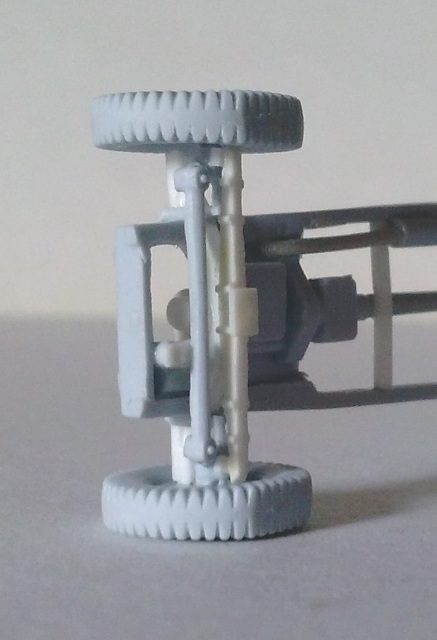 I added the inclined gear shift made with stretched sprue with its rounded end made by glue drops. The engine is missing. 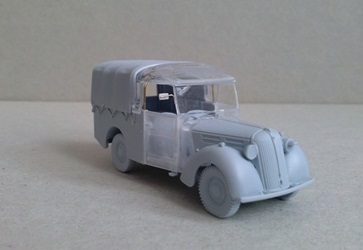 To avoid a see through effect I glued a plastic piece into the empty bonnet. 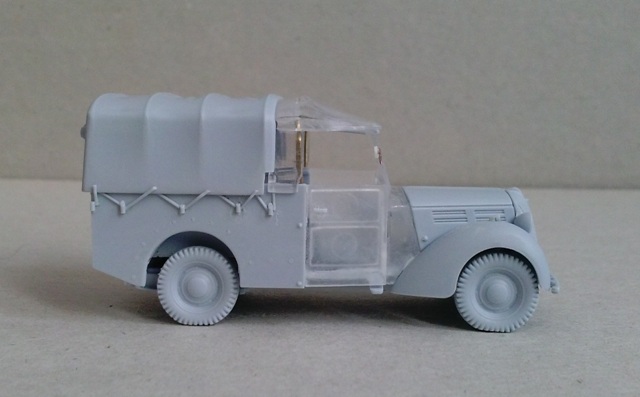 The rear chassis was shortened at the fuel cap position and a plate made of thin plastic was glued to close it. As for the Bedford MW, the door windows were made of soft transparent plastic and I choose to remove them. I replaced the door handles which are undersized. 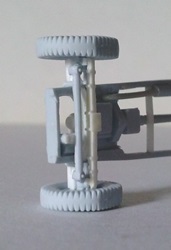 The position light on the mudguards received a thin stretched sprue segment to make the two rounded items in place of two vertical pins. When the glue was dry I sanded them, trying to obtain a half egg shape. The fabric cover was composed by two parts. The forward one for the driver and passenger seats and a rearward for the load area. This last one overlaps the vehicle sides a bit too much; I filed the edge to the transparent part level and then I thinned them. 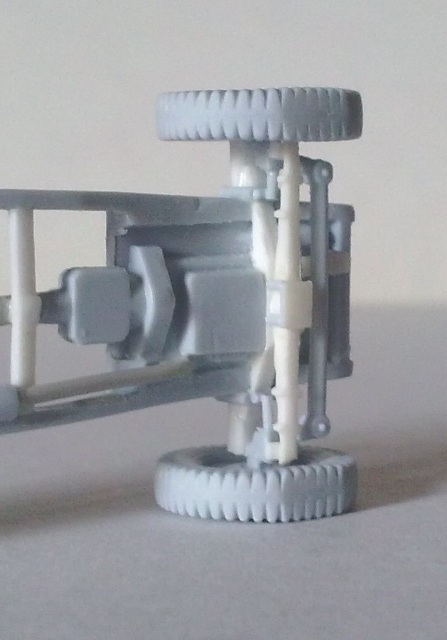 Its inner frame is partially represented. With stretched sprue I added the upper section of the inverted “U” rods of the rear part. If this part of the fabric cover is omitted, the frame should be reproduced. In the area of the forward cover part (made with transparent plastic in the kit) no frame is present at all. Having removed the windows, the inside is visible, so I made the visible rods using both metallic wire and stretched sprue. The fabric cover edges need the wire which kept it stretched going up and down from the body sides hooks; I made it with thin stretched sprue as well as their hooks on the truck sides, following a common alternation sequence. The rear view mirror was made with metallic wire (because the support was curved) and a little plastic rectangle. The whole was carefully glued on the windshield frame to avoid the “frost” effect on the transparent part. Chassis problem apart, in my opinion the kit is well done and looks very nice. If placed on a base or when parked on the shelf, the problem is barely visible. 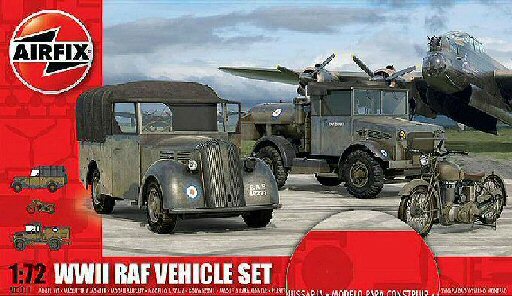 This vehicle series was used only by the RAF and can’t be used otherwise. It will look very well placed near a plane on an airfield background or on a dispersal field. In 1944 the RAF followed the troops in France. I don’t know if some Standard Tilly went there with the planes, but if so that is another background to place it. A particular thanks goes to Michael Shackleton of the Tilly Register for its courtesy and the permission to use its photos in this review.